Step 1 Cook spinach in microwave according to package directions; drain. Step 2 Place chicken breasts on sheet of plastic wrap on work surface and cover them with another piece of plastic wrap. Pound chicken with meat mallet or rolling pin until about 1/4 inch thick. Season both sides with salt and pepper. With chicken skin side down on board, put 1/4 of spinach down center of each breast. Crumble cheese over spinach. Roll chicken breasts, securing each with toothpick. Step 3Melt 1 tablespoon butter in large skillet over medium-high heat. Add roulades and cook, covered, turning them so they brown evenly, until done, about 10 to 12 minutes. Remove roulades and keep warm. Add chicken broth to skillet and de-glaze pan over high heat, scraping up any brown bits. Cook until broth is reduced by half, about 3 to 4 minutes. Stir in remaining butter. Add salt and pepper to taste. Spoon sauce over chicken. In Recipes-list.com we have selected the most viewed recipes from category - Main courses Quick and easy . Enjoy the best recipes specially selected for you! 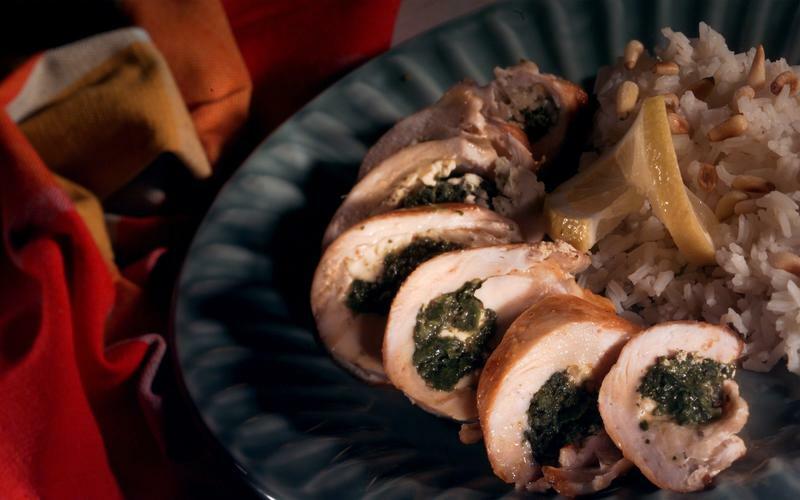 Chicken roulades is the right choice that will satisfy all your claims.